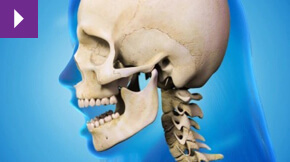 The temporomandibular joint connects the lower jaw and the skull. Problems with this joint, commonly known as TMJ Disorder or TMD, can cause pain, discomfort and difficulty with moving the jaw, along with a range of other symptoms such as headaches, neckache and sleep problems. Neck, shoulder and back pain. Earache, tinnitus or problems with hearing. Clicking and locking of jaw joints. It is estimated that up to 70% of the population will suffer from TMJ problems at some point, although many remain undiagnosed. Many people also don’t realise that a dentist trained in spotting TMJ Disorder can help manage and treat the condition. Dr Bradley Abrahams has had a particular interest in TMJ since the 1980s. He studied under Dr Roy Higson and Dr Niles Guichet, two of the world’s leading experts on TMJ Disorder. The primary cause of TMJ problems is the misalignment of the jaws with opposing teeth not fitting together correctly and this often results in bruxism – grinding, or clenching the teeth, particularly while asleep. I suffered with swelling around my lower face, headaches, sinus pain, sore eyes, loss of hearing and tinnitus, tingling in my arms, problems sleeping at night due to pain, which made me feel constantly tired, drained and miserable. This went on for years before I saw Bradley, who immediately diagnosed TMJ and provided me with advice on various ways it could be helped if not treated. He made me a small temporary mouth guard, which after a week had cleared up all my problems. I then agreed to have a full-size lower mouth guard made specifically to fit my mouth and it continues to keep my TMJ at bay. He was kind and very gentle and I would recommend his work to anyone.